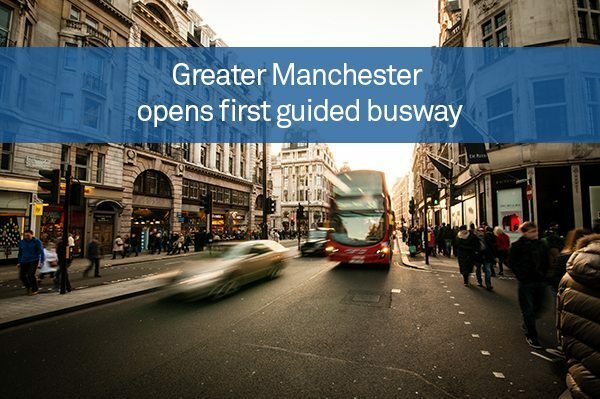 Public transport users in the west of Greater Manchester should see their travel times slashed this week thanks to the launch of the region’s first-ever guided busway. The unique concrete track will serve buses running from the towns of Leigh and Atherton to the centre of the bustling British metropolis, taking just 50 minutes to complete the entire journey – a rush hour time-saving of around half an hour on the routes currently available. Officially opening for business on Sunday (April 3rd), the busway will be reserved for a fleet of 20 new vehicles managed by UK transport company FirstGroup under the Vantage brand. Passengers are promised Wi-Fi and USB charging points, plush seating, audio and visual stop announcements, and climate control, as well as real-time transport information and bike parking at the seven purpose-built stops along the line. Timetables have yet to be announced but FirstGroup promises that services will “start as early as 4am and run beyond midnight”, with up to eight buses per hour between Tyldesley and Manchester. The guided busway connecting Leigh to Manchester consists of two raised concrete tracks – on one either side of the vehicle – that controls steering via a horizontal bus-mounted guidewheel. It takes its design cues from the Cambridgeshire Busway, which opened in 2011 and, at 13.3 mi (21.5 km) long, is believed to be the longest guided busway in the world.